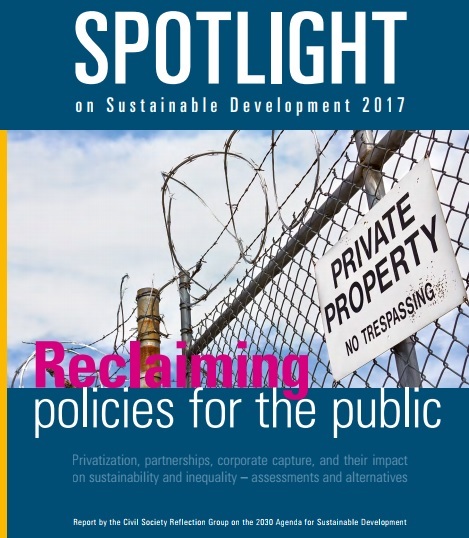 The Spotlight Report's input has been provided by national and regional groups and coalitions all over the world and it is supported by a wide range of civil society organisations and trade unions. The publication, which appears annually (see : Spotlight on Sustainable Development 2016: "The case for agroecology") is conceived as a global umbrella Report accompanying the reports presented by governments and international organisations on their implementation of the 2030 Agenda and the SDGs and its publications cover all the areas that the SDGs refer to, including agriculture and nutrition. According to Stefano Prato of the Society for International Development, implementing SDG 2 addressing ending hunger, achieving food security and improved nutrition, promoting sustainable agriculture, is taking place in the context of a contrast between two worldviews on modernity and food and nutrition, which are supported by equally distant production, marketing and distribution systems. Whereas smallholders currently account for up to 70 per cent of global food production, the need is emphasised to boost production and investments in agribusiness. Learn from 2SCALE how partnerships and bottom-up innovations can help you build a profitable and inclusive agribusiness. Biotechnologies are proposed to adapt intensive agriculture to the new climate conditions. There is also a push for nutrition-sensitive agriculture and bio-fortification to make up for deficits from industrial products based on large-scale production of a handful of crops. The Action Group on Erosion, Technology and Concentration (ETC) - - which addresses socioeconomic and ecological issues surrounding new technologies that could affect the world’s poorest and most vulnerable people - - explains in the Spotlight Report, that concentration processes in the agricultural inputs sector is moving forward in huge strides. Concentration processes in the pesticides and seed need paradigm shift towards diversity-based farming practices, argues Lim Lee Ching of the Third World Network. She calls for adopting approaches such as agroecology, that can also address the problem of climate change. Lim Lee Ching argues that concentration in power in food systems is leading to less diversity in the crops grown because of the tendency towards standardized, input-intensive crop varieties and away from traditional varieties and agricultural diversity. Supported by DivSeek - - a major international gene-banking project - - the mega-agribusinesses could gain proprietary control of plant genes, sequences and traits, resulting in “the ultimate corporate capture of agricultural biodiversity that is meant to be held in trust”. Simone Lovera of the Centre for Sustainable Development Studies (CSDS) at the University of Amsterdam stresses that biodiversity policy has been informed by neoliberal economic theories promoting the privatization and commodification of what biodiversity provides, and argues that reference under SDG 15 Life on Land to “ecosystems and their services” has supported a discourse on the values of these services and “encouraged governments to establish markets or other economic incentive schemes that provide payments for these ecosystem services”. *** The World Economic Forum vision includes a “public-private” UN, in which certain specialized agencies would operate under joint State and non State governance systems, such as the Food and Agriculture Organization (FAO) through a “Global Food, Agriculture and Nutrition Redesign Initiative”. This model also assumes that some issues would be taken off the agenda of the UN system to be addressed by plurilateral, often multi-stakeholder, coalitions of the willing and able. ***According to the Save Food Initiative of the Food and Agriculture Organization (FAO), every year around the globe, 1.3 billion tonnes of food are lost or wasted – that is one third of all food produced for human consumption. The countries of the global North waste almost as much food as the entire net food production of sub-Saharan Africa on annual basis and the amount of food lost and wasted every year is equal to more than half of the world’s annual cereal harvest. An introduction to the basic concepts of food, nutrition; the different forms of malnutrition; the frameworks for food security, nutrition security and livelihoods and their linkages. Understanding these concepts is key to be able to assess the nutrition situation and to design, implement and evaluate nutrition-sensitive programmes, investments and policies. Learn about the linkages between agriculture, food systems and nutrition, with concrete examples on how to integrate nutrition into food system policies, investments and programmes. Discover existing initiatives on which to build to integrate nutrition in your work. To be released in 2017, this module will provide guidance for nutrition situation analysis, and address key features of programme design, implementation and monitoring of nutrition-sensitive policies and programmes. Improve your understanding of the multi-sectoral causes of malnutrition and learn how to support integrated nutrition planning, through the use of the “problem-and-solution tree” methodology.